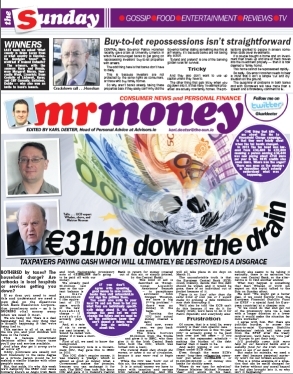 This week we looked at the IBRC (Anglo/Nationwide mashup) ‘Promissory Note’. This has been a hot topic of late but very few people have gone through the way it came about and how it works in order to ensure that we all know what is happening. This was written by Karl Deeter. Posted on Sunday, March 25, 2012, at 11:00 pm. Filed under Accountancy, Accountant, Advisors.ie In the Press, Banking, Bonds, Economics, Property, Sun on Sunday. Tagged ela, emergency liquidity assistance, exceptional liquidity assistance, karl whelan, michael noonan, patrick honohan, promissory note, sun on sunday. Bookmark the permalink. Follow comments here with the RSS feed. Comments are closed, but you can leave a trackback. ‹ Sun on Sunday, we are part of the new team! With the Mr. Money column!